Adding sound would be difficult, just dreaming. Also very helpful would be a side by side Tach and Speedo that would show RPM @ MPH comparing one transmission to another or rear axle gear change showing the benefit of one over the other. I’ve done the sheet comparing the two but it needs more! Yes Bruce, it sounds cool. The sound would be a little hard with my current knowledge but it doesn’t sound impossible. Unfortunately I am quite busy now with other projects. For what you want it would be nice to get some factory tested torque-rpm curves. The car can be modeled aerodynamically with added mechanical friction (factory data too). You can get to any level of detail. You can also add an automatic pilot with adjustable “personality”, plug in some maps and prove that performance and fuel consumption can be improved with more gears. Families of curves can be plotted and convince number geeks (like me) how much improvements you get with 4 or 5 or even 6 gears. The programming is very simple (some dumb Excel) but the factory data might be veeeeeery hard to come by. I love it! 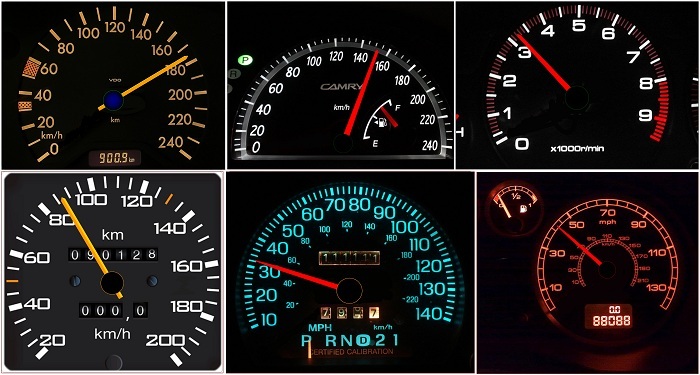 Having this type of visual tachometer will show people why they need an overdrive transmission for their old vehicle. I would love to see this where the user inputs their gear ratios, rear axle ratio and perhaps tire diameter of there old 2 speed or 3 speed trans and how engine RPM would change with a 5 or 6 speed overdrive! Add engine sound, automatically shift through the gears like at a race track and this would be so sweet!!!!!!!!!! Nice for rear axle ratio changes too! Sounds like a fun project for you, doesn’t it?